This Saturday is an important date in War Head's annual schedule - the Armies on Parade day in the Warhammer Store! 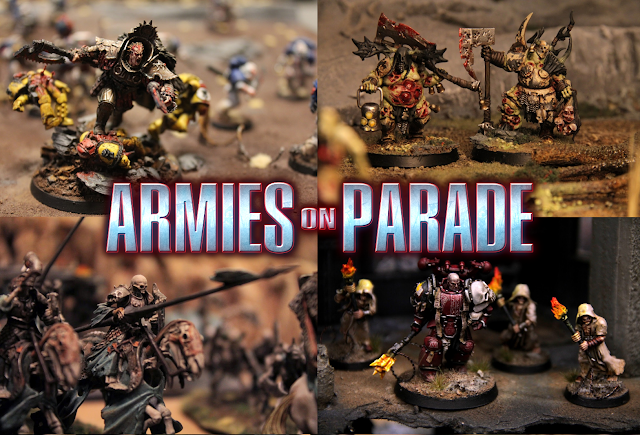 Games Workshop's army display competition has been a yearly attraction for our crew and Ollie especially, who has created several imaginative and memorable entries for the parade over the years. The competition has grown in popularity almost every year and we've always encouraged our friends to take part - the Parade Day is as much a social gathering as it is a painting competition. Everyone can enjoy the atmosphere and the inspiration provided by the event and every painted fig makes the world a better place! Our pal Mikael is currently the reigning champion - let's see if Ollie is able to seize the gold medal back to War Head's stall on Satuday!